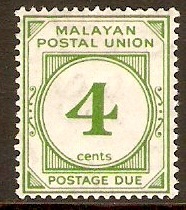 Malayan Postal Union 1936 8c Scarlet green Postage Due. SGD3. Mounted mint 1936 8c Scarlet green Postage Due. SGD3. 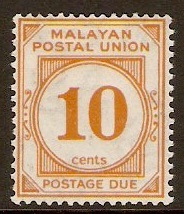 Malayan Postal Union 1936 10c Yellow-orange Postage Due. SGD4. 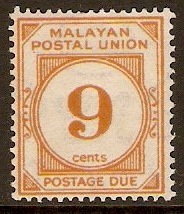 Mounted mint 1936 10c Yellow-orange Postage Due. SGD4. 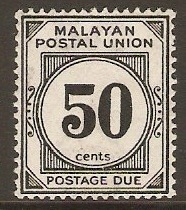 Malayan Postal Union 1936 50c Black Postage Due. SGD6. 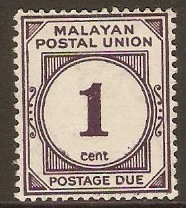 Lightly mounted mint 1936 50c Black Postage Due. SGD6. 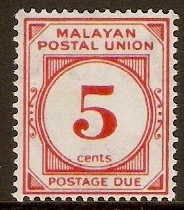 Malayan Postal Union 1945 5c Scarlet Postage Due. 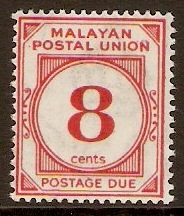 SGD9. Mounted mint 1945 5c Scarlet Postage Due. SGD9. 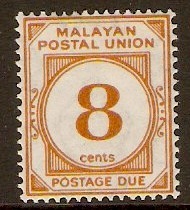 Malayan Postal Union 1945 9c Yellow-orange Postage Due. SGD11. 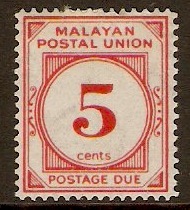 Mounted mint 1945 9c Yellow-orange Postage Due. SGD11. 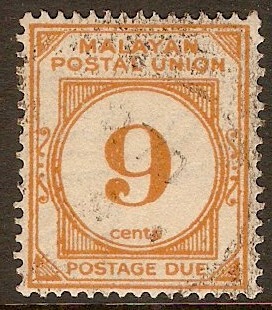 Used 1945 9c Yellow-orange Postage Due. 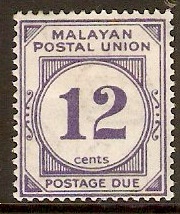 SGD11.